Everyone in Georgia knows Aimee Copeland’s story. A zip lining accident in 2012 led to a flesh-eating bacterial infection and doctors were forced to amputate her hands, right foot and left leg. A popular Atlanta athlete who is training for the Paralympics wants to empower people of all abilities, so she is teaming up with AMS Vans and FODAC (Friends of Disabled Adults and Children) to give away a wheelchair accessible minivan to a member of the local community. Aimee was empowered by the community’s show of support and today she is paying it forward. 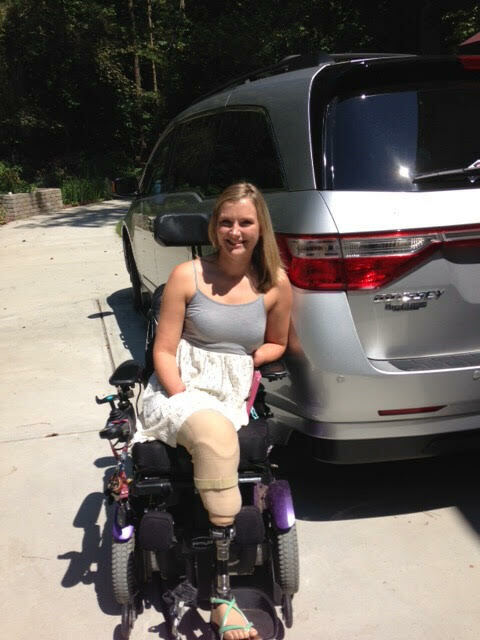 Aimee is partnering with Atlanta based AMS Vans and FODAC, for whom she serves as a board member and official spokesperson, to gift her reconditioned 2012 Honda Odyssey van conversion to someone who uses a power wheelchair for their disability. Aimee is donating her 2012 Honda Odyssey minivan with wheelchair conversion, automatic ramp and front row seats which are removable to accommodate wheelchairs. AMS Vans is donating $7,500 worth of reconditioning to make the minivan mechanically sound with cosmetic improvements. AMS Vans will also donate free oil changes and tire rotations for as long as the recipient owns the vehicle. Applications can be found on the Aimee Copeland Foundation website. They must be submitted electronically by February 7, 2019 and include an essay explaining how the van will be used and how it will allow the recipient to help make a difference in the lives of others. About Aimee Copeland Foundation: The Aimee Copeland Foundation (ACF) was started to provide free and low-cost counseling to people with physical, mental and developmental disabilities. Led by Aimee Copeland, a licensed master social worker with a background in eco-psychology, a quadruple amputee and a necrotizing fasciitis survivor, ACF inspires hope through action, builds community through inclusivity, provides healing through relationships, fights stigma through education, and breaks down barriers through compassion and humor.